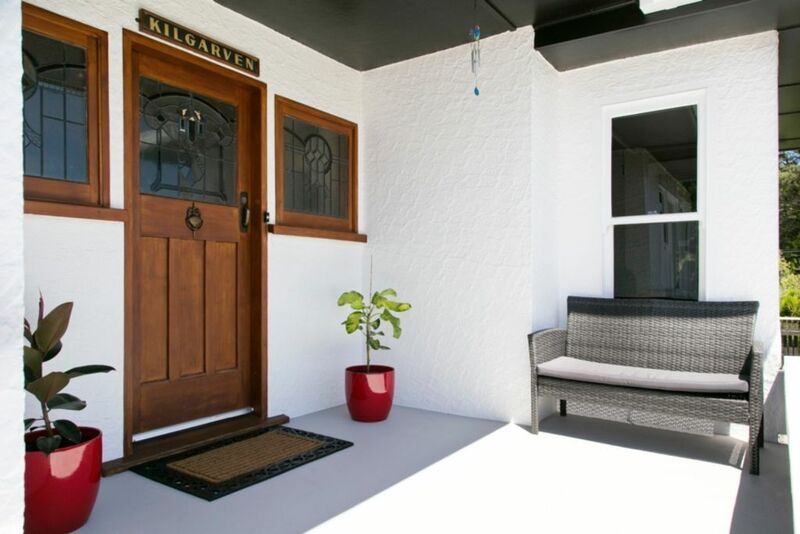 ‘Kilgarven’ is a distinctive and very special mid-century bungalow which has been lovingly restored and modernised, while retaining the original character where possible. Located an easy stroll to Taupo town centre, restaurants, cafes and the lake front. Three double bedrooms, master with ensuite and private north facing patio. Marvelous outdoor flow from living room on to the sunny deck with views overlooking the lake and mountain. Lovely and warm in the winter with a fire, heat transfer system, double glazing and insulation. Plenty of off street parking for 2 cars and a boat, safe behind a security gate with key-pad entry. Children’s playground directly across the road. Washing machine available, but sorry we have no dryer. Home is professionally cleaned between guests. If you are staying for 10 days or longer, our housekeeper will come in at a mutually convenient day/time to change the linen each week at no extra cost if required. Portacot, highchair and pushchair available at no charge. Please bring own linen for the cot. We also have a second portacot if required, please feel free to enquire. Wi-fi available for general internet browsing. Sky TV Decoder. Bring your Sky Card. Please respect our holiday home by leaving it tidy. Families preferred. A few quiet drinks are fine, but if you are wanting a house to party in, then sorry but this is not the house for you. Deposit required to confirm booking. Secure, private, and warm with lake and mountain views. toilet, combination tub/shower, Original cast iron bath with shower over the bath. toilet, shower, Ensuite off main bedroom. View of Lake Taupo and the mountain of the volcanic plateau from the dining/lounge area as well as a view of Acacia Bay. Lights at night are lovely! View of the three mountains of the volcanic plateau Tongariro, Ngaruahoe, and Ruapehu from the dining/lounge as well as the deck. Ducted heat pump to heat the house in winter/cool the house in summer. Beds will be made up before you arrive with sheets/blankets/pillows. Spare blankets are in the wardrobe in each bedroom. Washing machine in the laundry which guests are welcome to use. We have washing lines undercover in the laundry and outside as well. Wood burning fireplace if you wish, but we have had a ducted heat pump installed which heats/cools the whole house. Plenty of off-street parking for several cars and boat/trailer etc. All safe and secure behind a electronic security gate. There will be a towel and facecloth at the eand of each bed. Full kitchen with everything you would expect in a typical kiwi kitchen....oven, microwave, dishwasher, full sized fridge/freezer, plenty of crockery, serve-ware, plates and cutlery, kettle & toaster. Dining area with table and 6 chairs. There is also a breakfast bar with 3 bar-stools for informal eating. A selection of books and magazines in the wardrobe of the main bedroom. A selection of children's books and toys are in the wardrobe of the bedroom with the single/twin beds. Fully fenced section. Children can play on the grass or use the driveway to scooter around on etc. Elevated deck with outdoor table and chairs. Views over the lake and mountains. Sorry, the house is not wheelchair friendly due to the steps at the front door. This is our family holiday home that we are happy to share. Suits families or groups of friends. Located a 10 minute walk to the lake or the town itself in a very quiet suburban area. There is a children's playground directly opposite the driveway. Very impressed with the property. Very secure, and an excellent location. Though an older property it has been very well renovated and perfect for our weekend stay. Would definitely recommend to friends and family and will use again. Old vintage house, with all new and modern amenities inside. The house was great. Old but well kept and with very modern amenities, like central aircon, smart TV, double glazing and so on. Was walking distance to the Lake which we had a swim in. Will def make a plan to be back. My husband and I stayed here with friends for 3 nights as a base for walking the Tongariro Crossing. The house is beautiful, stunning views, and had everything we needed for our stay. Thanks Denise. Very lovely home with a nice view of the lake from the back deck. Our family had plenty of room to spread out. The kitchen and dining room was light filled and very appealing. Taupo is a fabulous location to use as a base while exploring the central North Island. It is an hour and a half from Rotorua in one direction, or Hawkes Bay in another direction. Within an hour and a half or so by car of the thee mountains of the volcanic plateau, for tramping the 'Tonagriro Crossing' (we recommend going with a guide), skiing/playing in the snow on either of the skifields on Mount Ruapehu in the winter, or mountain climbing in the summer. There are many guides to teach you how to fly fish for trout in the rivers, or you can swim/walk at the lake or go for a boat ride/sail/parasail/flight. Walk the many walking tracks along the lake or through the bush along the river and the Huka Falls. Don't forget to have a soak in the hot pools! So many things to do!